"It is a great joy that the world's first mass-marketed electric vehicle, the Nissan Leaf, has won the prestigious award of 2011 World Car of the Year," said Nissan chairman and CEO Carlos Ghosn. "This accolade recognizes Nissan Leaf, a pioneer in zero-emission mobility, as comparable in its driving performance, quietness and superb handling to gas-powered cars. And it validates Nissan's clear vision and the values of sustainable mobility that we want to offer to customers around the world." 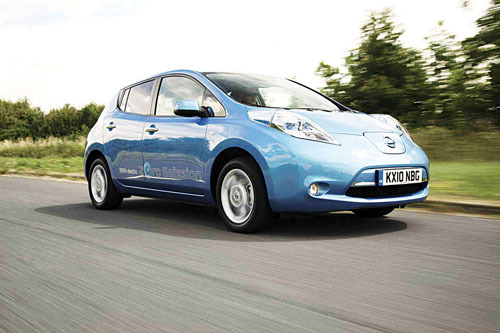 The World Car Awards jurors observed that the Leaf was the “gateway to a brave new electric world” from Nissan. This five-seater, five-door hatchback is the world's first purpose-built, mass-produced electric car. It has a range of over 100 miles on a full charge, claims Nissan, takes around eight hours to recharge using 220-240V power supply, and produces zero tailpipe emissions. Its low centre of gravity produced sharp turn-in with almost no body roll and no understeer. The good news - it feels just like a normal car, only quieter. Vehicles are selected and voted on by an international jury panel comprising 66 top-level automotive journalists from 24 countries around the world. Padraic Deane represents Ireland. Through their respective outlets they collectively reach an audience of many millions world-wide. The Nissan Leaf succeeds the 2010 winner of the World Car of the Year, the Volkswagen Polo. The Ferrari 458 Italia was chosen from an initial entry list of 14 new cars from all over the world, before three finalists were chosen from a short list of 10 - the Ferrari 458 Italia, the Mercedes-Benz SLS AMG, and the Porsche 911 Turbo. The Ferrari 458 Italia succeeds the 2010 winner of the World Performance Car, the Audi R8 V10. The Volt was chosen from an initial entry list of 12 new vehicles, shortlisted to 10 from which the three finalists were selected: the Chevrolet Volt, the BMW 320d EfficientDynamics Edition and the Nissan Leaf. To be eligible for the 2011 World Green Car* award, a vehicle had to be new, or substantially revised, in production and introduced for sale or lease to the public in quantities of at least 10 in at least one major market during the period beginning January 1, 2010 and ending May 30, 2011. Tailpipe emissions, fuel consumption, and use of a major advanced power plant technology (beyond engine componentry ), aimed specifically at increasing the vehicle's environmental responsibility, were all taken into consideration.